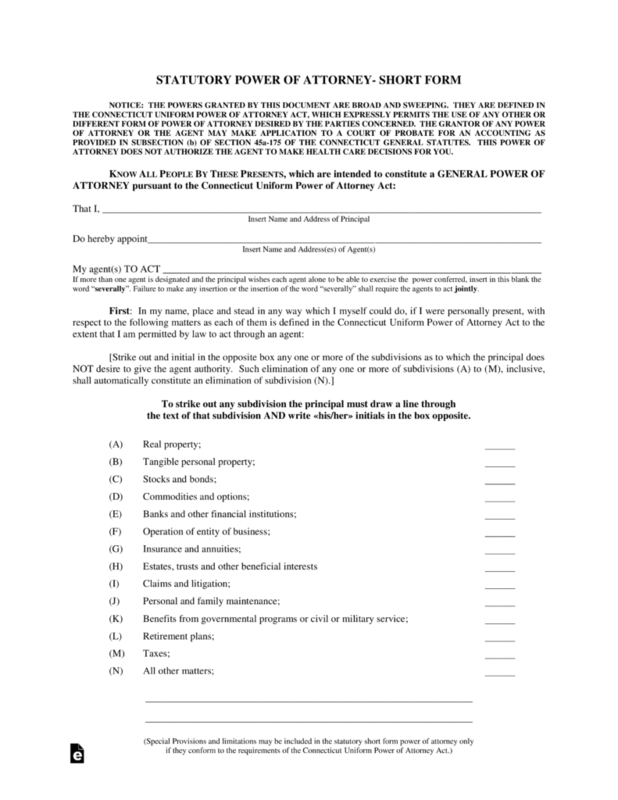 Connecticut Power of Attorney Forms legally allow a person to specify another person to act as an agent in the carrying out of certain specified business. These forms are often used in situations where the person appointing the agent (the “principal”) anticipates being unavailable either physically or mentally and wants to make sure that he or she has a trusted person to act in his or her stead. Because you are granting power to another person to transact your business in your best interest, it is vitally important that you trust the person you are appointing. In Connecticut, the power of attorney laws are currently located at C.G.S.A. P.A. 15-240. Appointment of Health Care Representative – A person can select a friend or relative to determine what healthcare actions should be taken, in the event that the individual can not communicate for themselves. It is important that you let your agent know your medical treatment wishes. Durable Power of Attorney – This form allows an individual to appoint someone to be their agent and make financial decisions on their behalf, even if the principal becomes ill and can no longer make decisions for him or herself. General Power of Attorney – This type will become void if the principal becomes incapacitated and can no longer act on his or her own behalf. Limited Power of Attorney – This form can be used for specific transactions or business where the principal anticipates being unavailable for a certain period of time. It is important to describe with specificity the acts for which the agent can act. Parental (Minor Children) Power of Attorney – This form allows a parent to designate a trusted friend or relative to take care of and make decisions on behalf of the parent’s children in the event they will be away temporarily. Real Estate Power of Attorney – The usage of an Attorney-in-Fact to help with either the buying, selling, or managing of property for the benefit of the owner. 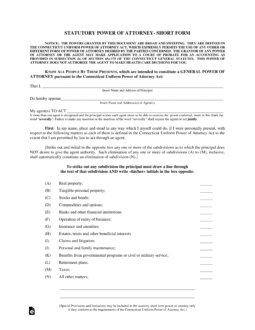 Revocation of Power of Attorney – This form can be used to revoke any power of attorney you may have created. It is very important that you make sure everyone that is aware or in on notice about your old document, knows that you have revoked it. Tax Power of Attorney (LGL-001) – In the event you want an accountant or another financial agent to take care of tax filings on your behalf, this is the form you use. Vehicle Power of Attorney – In the event that you want someone to handle the purchase, sale, titling or registration of your vehicle, you should use this form.